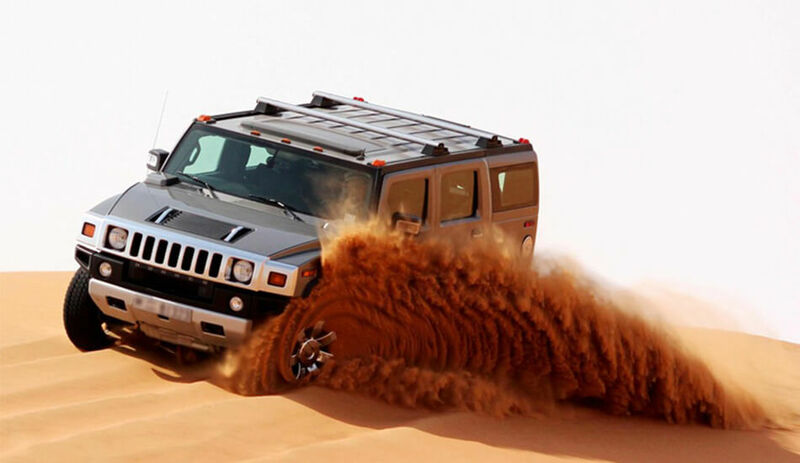 Feel the luxuries of the desert with an exciting Hummer desert safari. Your driver guide will be there to pick you up from your hotel	and drive you to the desert in a cozy Hummer jeep. The first activity in the desert will be an exhilarating dune ride over the tall dunes. The dose of adrenaline will recharge you for the exciting tour up ahead. Stop at a camel farm where you can pet and observe the gentle giants	of the desert. Continue with a drive over the dunes and then a stop at the summit of a dune to observe the phenomenal desert sunset. Be awed at the golden glow that shines upon the whole desert giving it the last ray of life before dipping below the horizon. Head to the camp where Emirati hospitality is awaiting you. You will be served with Arabic coffee (Qahwa) and dates, an Emirati	tradition that still continues for the welcoming of guests. Get busy with shisha or henna painting until it’s time for a dinner. Enjoy a delicious BBQ inner under the stars with a live belly dance performance to keep you entertained. The hummer desert safari	maintains a perfect balance between luxury and the desert.